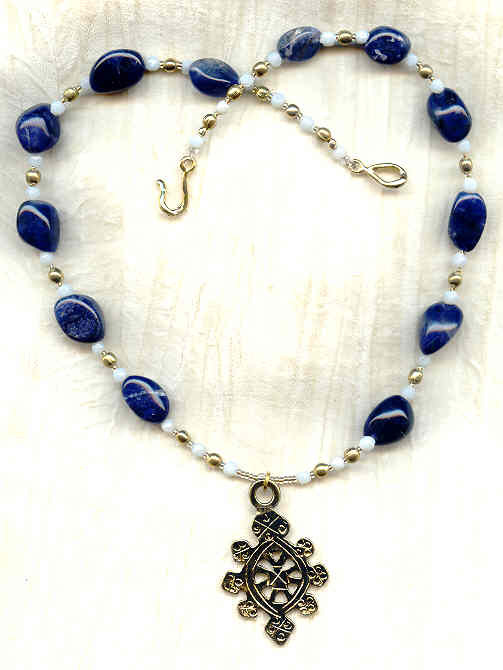 Sodalite is a mysterious stone: just when you think you've plumbed the depths of its deepest blueness, you turn a corner and come upon a cloud of white or a streak of mossy gold. This is one stone that may be studied for a lifetime, but still won't reveal all its secrets. Here its teamed up with some smaller handmade alabaster glass beads and brass accents. All serve to show case the antique gold tone turtle totem pendant. The pendant is about 2" long. 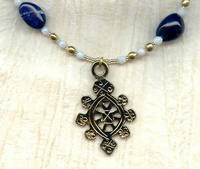 The necklace measures about 21-1/2", and closes with a gold plate over pewter hook set. The perfect piece for the gent who doesn't care to tell all, it's from SPARKLE PLENTY, of course.